Oil Leak Causes and How To Fix Them | Gold Eagle Co. Yes, it’s easier to just ignore the small puddle of oil forming under your car. Or pretend that burnt oil smell is not coming from your engine. And is that blue smoke coming out of your tailpipe? Oil leaks are something you cannot afford to ignore. It doesn’t always take a trained mechanic to figure out what causes engine oil leaks. A little hunting can reveal a lot, just don’t put it off or it can cause damage to your engine. Is your car leaking oil? Fix it today with No Leak. Leaks left unchecked can get on rubber hoses or seals and cause them to degrade prematurely. Leaking oil can cause ugly stains on your driveway and are an environmental hazard. And worst of all, engine oil leaks are a fire risk in your engine compartment and can result in catastrophic engine failure at the worst possible time, not that there is a good time for catastrophic engine failure. So fixing oil leaks should be your number one priority. To check for engine oil leaks keep a close eye on your oil dipstick. If the level drops over time you’re losing oil. 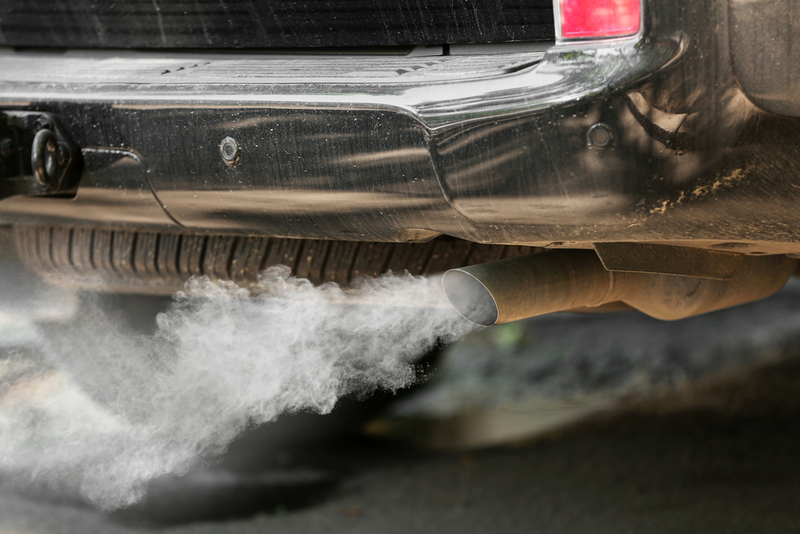 While driving, check and see if blue smoke is coming from the tailpipe. Blue smoke means oil might be leaking into the engine itself. After a drive, take a sniff to smell for burning oil. This could mean oil is leaking onto hot components of the engine itself. Lastly, check for the classic oil stains or puddle under the engine compartment, especially after it’s been sitting overnight. Should you find a puddle under the engine, look a little closer. If the liquid is red it’s probably transmission fluid. If the liquid is green or orange and has a sweet smell, coolant is the culprit. Brown fluid will indicate an engine oil leak. We’re glad you asked. 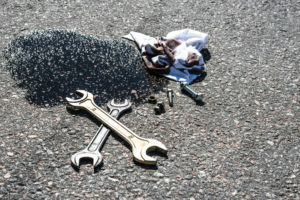 The vast majority of leaks are due to degraded engine gaskets, oil pan leaks, oil seals or bad connections. Crawl under the car and check the oil pan seals. While you’re there also check the oil pan drain plug. Next check the timing cover seal and the valve cover gaskets. Problems here can require extensive repairs that are not cheap. Don’t panic! You can always try fixing oil leaks yourself first. It’s not hard. Here are a few options. The most cost-effective and easiest place to start fixing oil leaks yourself is by using a stop leak additive such as No Leak. Once No Leak® is inside your vehicle, No Leak softens and conditions rubber seals to safely stop and prevent automotive leaks. It’s best used when engine oil leaks are first detected but is still effective on leaks that have been there awhile. The next solution is to grab a torque wrench and check for loose bolts starting with the oil pan. Bolts can loosen over time. When the oil pan seems snug move to the timing belt cover then the valve covers. Just note that each car model requires you tighten bolts in a specific pattern and to a certain tolerance. Most auto parts stores can provide you with these specifications. A leak of any kind should be addressed immediately, but an engine oil leak even more so. Knowing what causes engine oil leaks will help you know where to look and how to start fixing it yourself. Don’t ignore it, or hope it fixes itself. Be proactive. Protect and preserve your vehicle’s performance so you can keep it on the road where it’s meant to be. my car add more 0.4 liter engine oil when it change engine oil, after that began to leak oil under the engine, it can see oil leak on the ground, it last around 6 month. Recently changed oil again, it still leak a little on the ground ,it seems reduced leak. Does it stop leak by the time goes ? Hello, we can offer you a $10 rebate with which you can try our NO Leak Engine Oil Stop Leak. Please email us at marketing@goldeagle.com if you are interested. Thank you. how can i get some no leak engine oil stop leak? Just read your offer and I will send recipt to you to get my rebate!!! Hello, no not 200 miles in one journey. Hi, Pam. Yes, it is safe to use with all automotive oils, including synthetic. My car engine leaks from the top any special advice? Hello, Hello, please contact us at marketing@goldeagle.com and we can give you the link for a $10 rebate which you can use to try our No Leak Engine Oil Stop Leak. Thank you! Hi Jesus, NO LEAK works by revitalizing/restoring loose or worn-out seals and gaskets that may be causing the leak(s). If the leak is due to completely broken seals or gaskets or damage in the crankcase, a mechanic should be consulted. Please contact us at marketing@goldeagle.com if you have any questions about this. Thank you. Im experiencing a burning smell and believe it’s my loose valve gaskets. You think I should try this product? And where do I apply it in my car? Hi Lorin. This could be caused by an oil leak. We would suggest trying NO LEAK® Engine Oil Stop Leak to see if that fixes the issue. It if persists or gets worse, a mechanic should be consulted. Add it to the crankcase by following the directions on the bottle. Please contact us at marketing@goldeagle.com if you have any questions about this. Thank you. 2.0 Turbo Chevy HHR 2008 dumped all oil on drivewary when returning home? Hi Mel, since we are not able to assess you car in person we would suggest you take it to a professional mechanic. Thank you. Right side and it is exactly down the two belts. That point is making mare moise what is solution. Price $250.so what i am go na do…?? Hello, since we are not able to assess your car in person, we suggest consulting your nearest professional mechanic(s) for the best advice. I bought a cheap van that was part of,a taxi company. I met,the cab driver, who is the,owner of the taxi cab company. On my way to see about a Nissan. The owner picked me up in a taxi. He said he had a great van that he would sell me. Took me over to look at it.,it didn’t start. He said the van was great. I,took his word for it. After insuring the van, getting plates, etc. I started the van. The wheel bearing was shot. He took it to be fixed the next day. He kept stressing that he was local and if I ever had any problems, he was not going anywhere. I played him a few hundred bucks and owed him the rest. He really wanted the rest. Driving the van home, the smell of burning oil was ever present. I took it to a service station and on the lift we saw oil leaking, as well as transmission fluid. The mechanic said the engine was leaking oil and it would be 500 dollars for starters to fix . I don’t have the money and am on social security. The van is 20 years old. The mechanic said I should get oil and check the levels every time I stop. I knew so ething was wrong before I bought it. I think God was telling me there would be trouble ahead. Don’t know what to do. The guy said it’s no big deal. He also said before that when o gave him the extra money that would be that. Any suggestions?? Hi Corinne. Unfortunately, since we are not able to assess your vehicle in person, we recommend taking it to a trusted professional mechanic to be evaluated. Also, you could try No Leak Engine Oil Stop Leak to see if that stops the oil leak. Please contact us at marketing@goldeagle.com if you have any questions about this. Thank you. I have a 1968 camaro I just bought…it runs wonderfully but does have on a 3 speed automatic transmission…after running the car on the highway for about 2 hrs around 60 mph the “temp” light came on….I check under the hood to find oil had been blown all over the drive side of the engine bay…. (the fan) however I’m unable to locate the leak…it seems to be on the lower part of the block….any ideas on what I should be looking for? Hi Clark, Unfortunately, since we are not able to assess your vehicle in person, we would suggest taking it to a trusted professional mechanic to be evaluated. I have been told that I have an oil pan gasket leak. Can “stop leak be used in BMW’s from 2006 and newer? Hi Theodore, Yes. It is designed to work on seals and gaskets. Please contact us at marketing@goldeagle.com and let us know if you have any questions. Hi Tanya, since we are not able to assess your car in person, we would recommend taking it to a trusted mechanic to be evaluated. Hi Tanya, since we are not able to assess your car in person, we would recommend taking it to a trusted mechanic to be evaluated. You could also try No Leak Engine Oil Stop Leak. Please email us at marketing@goldeagle.com if you have any questions. I have a leak underneath. I don’t want to invert too much money in this old of a car (1998 Isuzu Rodeo). I’ve been tried the STP stuff, it didn’t work. I’ve tried using b thicker oil, still nothing. Any ideas? Hi Andy, since we are not able to assess your car in person, we suggest taking it to a trusted professional mechanic to be evaluated. You can also try our product, No Leak Engine Oil Stop Leak if it is your engine oil that is leaking. Please email us at marketing@goldeagle.com if you have any questions about this. Thank you. Hi June. Since we are unable to assess your car in person, we suggest taking it to a trusted professional mechanic to be evaluated. I have used the no leak engine to my Toyota Yaris. Could you please answer my question bellow? 1. How far I need to replace the engine oil after mix with the no leak engine ? 2. If still leaking, do you recomend to re do again? Hi Hari, Typically, if after 200 miles of normal driving the leak persists or get worse, consulting a certified mechanic may be the next step. It is not recommended adding more than one dosage. NO LEAK does not change the maintenance schedule of the vehicle and its efficiency should not be affected by an oil change. Please contact us at marketing@goldeagle.com if you have any questions about this. Thank you. So this is basically a commercial? I was hoping to have a play by on areas to check for oil leaks!?!? Because leaks show up in so many different ways (structural damage, seals, gaskets, hoses) it would be difficult to post specifics – we suggest bringing your vehicle to a trusted mechanic to be evaluated in-person if you are unsure about a leak. Please contact us at marketing@goldeagle.com if you have any questions about NoLeak products. Just noticed my oil leaking a couple days ago. Now my Che check engine light is on. Any advice? Hi Connie, we suggest bringing your vehicle to a trusted mechanic. Or, you can try our No Leak Engine Oil Stop Leak to see if that helps. Please contact us at marketing@goldeagle.com if you have any questions. For this type of leak we’d suggest NO LEAK® Engine Oil Stop Leak. It safe for that vehicle. Please contact us at marketing@goldeagle.com if you have any questions about this. Thank you. This could be caused by a leak. Trying NO LEAK Engine Oil Stop Leak may help. Of course, if the leak continues or gets worse, then perhaps consulting a mechanic would be the next best option. Please contact us at marketing@goldeagle.com if you have any questions about our product. Thank you. What is the best thread sealant to use on bolt to stop a oil leak coming through a bolt? We do not offer a product for this situation. The best option would be consulting a certified automotive mechanic. Hi Winifred. Since we are not able to assess your car in-person, we suggest taking it to a professional mechanic to be evaluated. You can also try our No Leak Engine Oil Stop Leak. Please contact us at marketing@goldeagle.com if you have any questions about this. Thank you. Hi Lillian, There is a very good chance that NO LEAK Enging Oil Stop Leak can resolve the oil leak. We recommend trying it as it is completely safe. If the leak continues after the treatment, then perhaps the best next step is to consult a certified mechanic for other options. My 2008 Dodge Grand Caravan sith 10553 miles, shows some sign of oil leak on Valve Cover gasket, Oil Pan gasket, Transmission Oil pan gasket and also the power steering hose. What is the best and safe engine oil stop leak and power steering fluid stop leak for this ehicle? Cylinder head gaskets in Subaru Forester 2002, 2.5 engine are known for that. Is Synthetic Oil a cause for leaks? When head bolts extend (after usage), and gasket compresses by heat and wear, is the finer oil molecule of the synthetic oil a reason to leak pass the gaskets? Again, is it possible a SAE 0-40 grade oil more prone to leak through than a SAE 5-20 one? Any body out there that can address this issue? Thanks. That’s exactly what I am looking for. Thanks Gold Eagle for this detailed post. I was facing the same issue with my car but after following your blog now leakage is completely stopped. At last there is no oil left because of which I have visit gomechanic Honda service center to replace the oil at very low cost. My oil leaks and have been told that it is from valve gasket. Have it repair 3 times and it still leaks could it be something internal or do I need a new motor. Hi Louis, since we are unable to assess your car in-person we would suggest taking it to a professional mechanic. Or, you could try our No Leak Engine Oil Stop Leak to see if that helps. Please contact us at marketing@goldeagle.com if you have any questions about this. My husband didn’t realise he had lost the oil cap, drove the car, and oil splashed inside the bonnet and top of the car. Now while we both know we had to get a replacement cap ( which has been ordered), what can we use to clean the oil splashes??? Hi Rachel, you can try 303® Marine Citrus Cleaner & Degreaser or 303® All Purpose Grill Cleaner & Degreaser if you’d like. Please contact us at marketing@goldeagle.com if you have any questions about either of these products. after driving my truck i notice clear looking oil dripping? about the size of a dime. What could it be? Hi Sonia, since we are unable to assess your car in person we suggest taking it to a trusted professional mechanic to be looked at. My car which is Volvo 960 estate engine leaks badly. What do I do ? Hello Pius. Since we are unable to assess your car in-person we would suggest taking it to a trusted professional mechanic. Do i poor this oil strieght into the engine..
Hi Kevin, No Leak goes into the crank case reservoir (where the motor oil goes). Please contact us at producttechsupport@goldeagle.com if you have any questions about this. Thank you. Hi Dennis. Since we are unable to assess your vehicle in person we would recommend taking it to a trusted professional mechanic. If you suspect you have an oil leak then you can always try No Leak Engine Oil Stop Leak. Please contact us at marketing@goldeagle.com if you have any questions about this. Thank you. My 2012 Kia Sedona was leaking oil profusely. She brought it to the dealer and they replaced the oil pressure sensor. This does not make sense to me. Is it possible that was the problem? Hi Cheryl! In this particular situation, perhaps it would be helpful seeking a second opinion from a different professional technician. If you have any other questions please contact consumer support at productttechsupport@goldeagle.com. Hello! A bit over the line on the dip-stick will not be harmful. However, if it is excessive we recommend trying to syphoning the oil. Or, have a professional technician drain some of it. If you have any other questions please contact consumer support at producttechsupport@goldeagle.com. I had to put a new alternator in my car the old one was drenched in oil is the oil near the alternator or can it be some other fluids? I have a 2005 chevy avalanche that has an oil consumption problem. No oil is found on the ground. Where is the oil going? Hello! Thank you for the question. This is an unusual situation. Perhaps asking professional technician may be the best step. If you have any other questions please contact consumer support at producttechsupport@goldeagle.com. Hi, Reece! We recommend to try adding No Leak® Engine Oil Stop Leak, this may fix the leak. However, if the leaks continues after 200 miles or a few days, or gets worse, then consulting a mechanic may be the next best option. If you have any other questions please contact consumer support at producttechsupport@goldeagle.com. Took her vehicle in for oil change. They say she needs an oil seal replaced. The seal cost $18 bucks OEM, purchaed on the net. Yet her dealership estimates the repair labor to be a whopping $1,924 ‍♂️. It is oil seal ( 80x98x10 ) . Can your product help her save her 2005 Honda Hybrid ?? ponitac Vibe 2009. Previously no problems. Had regular service always. Noticed oil stains on driveway. Checked oil level down 2 to 3 quarts, No burnt smell no blue smoke out of tail pipe. Taking it for service for fixing Monday. What could it be? Just an educated guess. Don’t want to be taken cause I am am girl. Hi, Christine! This does sound like an oil leak. It’s always a good idea to get a second opinion, just to be sure that the diagnosis and pricing are consistent. If you have any other questions please contact consumer support at producttechsupport@goldeagle.com. I have a 1989 gmc stepside truck when I start the truck Blue smoke comes out of the exhaust pipe, and carbon gets on my garage floor. I also have a small oil leak on my floor. Will No Leak help me with these issues. I’ve just changed my oil and added a bottle of “No Leak”, now the dip stick shows over fill. Your instructions say: “Pour contents of bottle into oil reservoir, do not overfill.”….help? Hello! It depends on how overfilled it is. A bit over the line on the dip-stick will not be harmful. However, if it is excessive then trying to siphon the oil may work. Or, have a professional technician drain some of it. If you have any additional questions please contact consumer support at producttechsupport@goldeagle.com. Hi, my car has been leaking oil from the bottom for a couple of weeks now and it has started loosing coolant, does this oil leakage has to do with this? Where do I pour this No Leak? Do I pour it inside the Engine or Radiator? Can a main rear seal be replace by removing the oil pan on a 2008 Hyundai Sonata. Something be done by not cost me a lot? my car is leaking oil underneath after a washer was repkaced.This was done when my husband changed oil on the car.And now There are sounds coming out of my car underneath the drivers seat.And when I turn my car the front right wheel has a scratchy sound as if it is rubbibg against something.It is a Peugeot 208 .Model 2013.Please help. I WOULD LIKE YOUR INFO ABOUT MY TRUCK 99 FORD 350 DULLY 6.8/415 THERE BEEN LEAKING OIL AND TRANSMISSION BUT THERE NO SPOT ON FLOOR FROM LEAKING THERE NO NOTICE, TILL I SEE THE CHECK LEVEL OF OIL IN THE ENGINE ASLWAYS EMPTY OF OIL OR TANSMISSION WHY?? I WAS TRIED FIGURE IT OUT WHY BUT FUNNY THAT ENGINE IS CLEAN SO NO MAKE SENSE…. Hi, John. This situation seems to be rather difficult to diagnose without a proper inspection. Perhaps consulting a certified mechanic would be a good option. I own a 2006 Nissan Murano, my concern is that the engine oil leak but shows nothing on the ground. I use Total Quartz SL 5000. I suppose to change the engine oil every 5000KM, but I get the low engine oil in every 2500KM – 3000KM. I have a 2007 Holden Captiva car and its leaking oil, i have taken it in to a mechanic but they said it wasn’t leaking from the bottom of the car but it was leaking oil inside somewhere from the engine and suggested to take it to another specialised mechanic not sure why but would you be worthy to try the No leak product or not? Hello, it certainly would not hurt to give NO LEAK Engine Oil Stop Leak a try to see if it stops the leak. My mom’s 2007 Hyundai entourage has been leaking a large amount of oil for quite a while. as i changed the starter i noticed that there was a puddle of oil in several places in the engine and that every time we moved the van there was a good amount of oil left on the ground very quickly. what kind of leak am i looking at? The mechanic found one in the car, but they can’t find where it is coming from. I am bringing the car in for service, how can they find the leak if they don’t know where it is coming from? Hello, perhaps maybe seeking a second opinion would be best in this situation. Pretty darn sure I have an engine oil leak on my 96 legacy outback. Any suggestions? Does it truly work, I will get some today. The leak started a week ago. Hi, Debra. We recommend to give it a try! Typically, if the product does not fix the leak within 200 miles of regular driving, we recommend consulting a certified mechanic as repairs may be needed. I have 2014 Jeep Wrangler it leak oil on a very cold while I was warming it up. I had it checked out after and was unable to find any leak. Thanks for this helpful information!!!!!! Hi I use No Leak more than once with the same oil? I have put No Leak in and there is still some leakage after 200 miles. Hi, Richard. If you are still seeing issues after a treatment, perhaps it would be best to consult with a professional. If you have any other questions please contact us at producttechsupport@goldeagle.com.